Remember this little guy that I blogged about earlier this month? I normally am not very quick about getting my items listed in my Shop, but I did list this guy on Monday, and today it sold. 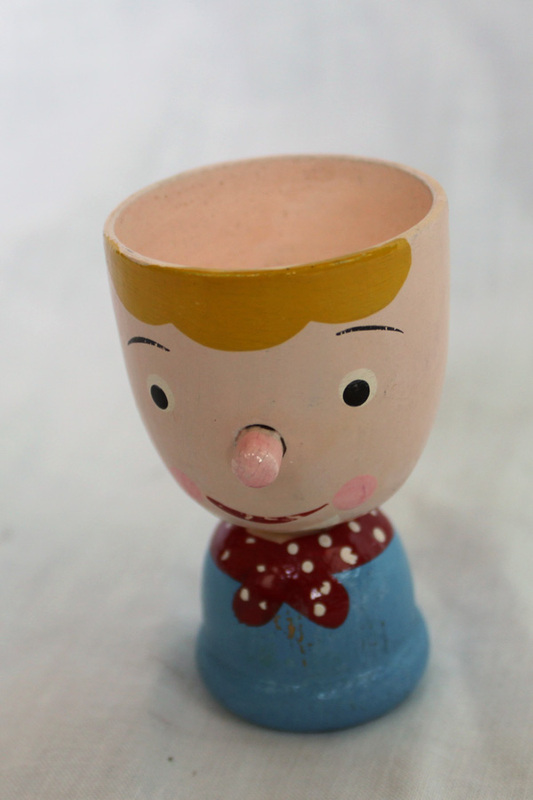 The woman who bought it said that she collects egg cups and didn’t have anything like this one. This guy will be her 40th egg cup. I would love to see a photo of that collection. Do you collect items? Do you like link parties? If so, Vintage Velda is starting a new monthly link party to show off your collections and collectibles. Go check out her post, What Do You Collect? and link up. I hope to take a photo or two and link up later in the week. The egg cup is simply adorable. If I were an egg cup collector (There is always time to add a new collection) I would definitely want those beauty in my collection. Thank you so much for posting about the collectibles party! I can’t wait to see yours. . .the link party is open all month. Thanks Velda. I really hope your link party gets many links. I love to see what other people collect. It is a wonderful idea.